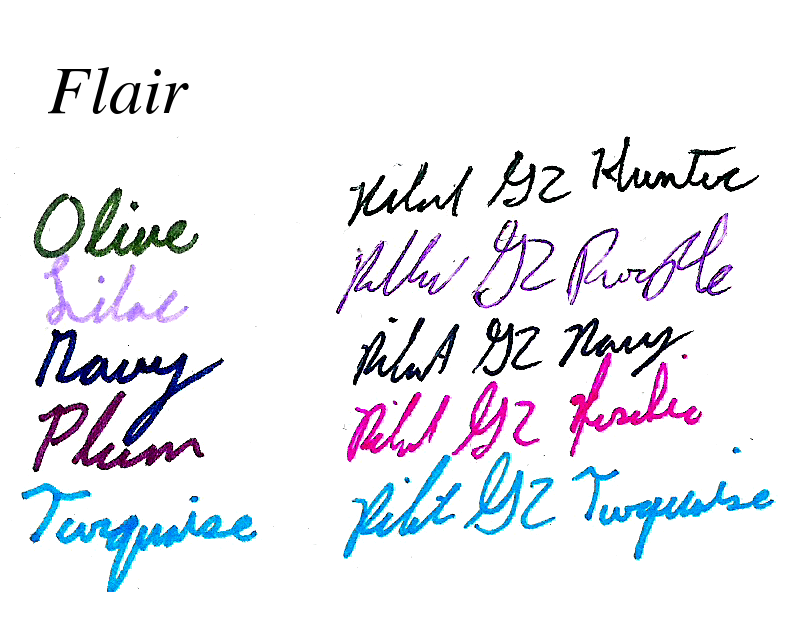 And now for part 3 of my look at the 20 colors of Papermate Flair pens. This time I’ll be looking at five of the cooler colors in the lineup. I’ll just get started. Olive – Olive is a nice green, forest-y color that looks quite natural and is very pleasant. It is quite conservative and laid back. One might be able to get away with using it at an office, but it’s unlikely. In poor lighting it almost blends in with dark blues and blacks, though. On the smearing side it’s one of the worst, easily smearing and becoming unreadable with contact with water. 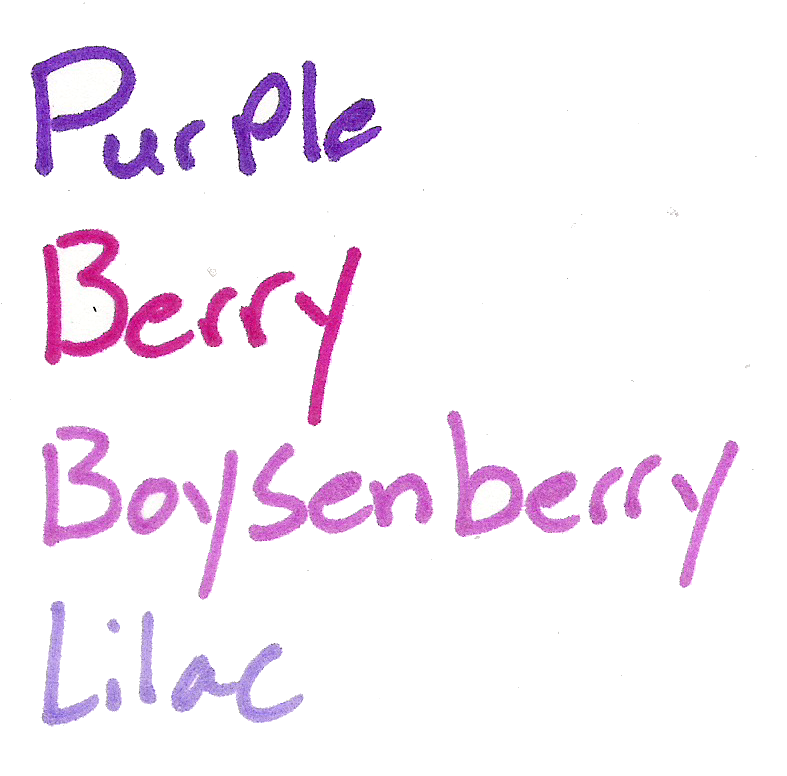 Lilac – It’s a light purplish color that is smooth and quite easy to look at. It wouldn’t be appropriate in most offices, but in many a field of flowers there are similar colors. The color looks almost washed out before water is applied, but it smears and feathers probably the least out of the entire set. Navy – Navy is a very dark, office-appropriate blue that goes well in most places. Artistically, it would be most at home in the dark, but there may be other applications. It does smear, but very little, and it is often readable afterwards. The main problem when water is applied is that there is so much pigment that it covers a wide area with a bluish tinge. Plum – A bit off from most of the fruit I’ve seen, this plum is a dark, red-ish, purple color. It could pass for a plum still, just not one from a supermarket. It could also make its home in an office for a bit of fun, but not for everything. It bleeds, feathers, and smears pretty badly, but does stay mostly readable. Turquoise – Turquoise is a nice color at points, but it shades quite a bit, and the color variation can at times be unpleasant. It’s a good sky, but doesn’t look like the stone, and going over it multiple times will turn it into more of an aquamarine. If your work doesn’t have a problem with blue, it should still work. With a wipe from water nothing changes, but if left for a few moments the color dissolves completely and is unreadable. And that’s it for part 3. These colors are some of my favorites in the set, and much more usable than their warm counterparts. Next time I’ll be taking a look at the remaining 4 pens, which aren’t officially named anywhere I can find.